Shop for books, DVD and music to support your journey. 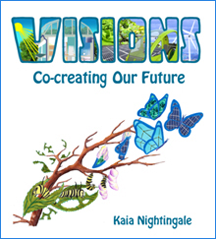 “Visions – Co-creating our Future” published August, 2014, offers possibilities for a sustainable, fulfilling future based on current technology and know how by streamlining resources, energy and labour. We look at the beliefs we need to shift to allow this possibility, feet-on-the-ground action to move the vision forward, and explore a new story for humanity. Beautiful, relaxing, inspired music recorded in the Himalayas to capture the tranquility of a meditative life there. © 2002. Available only from Kaia, in person or through PayPal. Click here to contact her.